Corruption is widely prevailing in Bangladesh as reported by Transparency International Bangladesh and other sources. 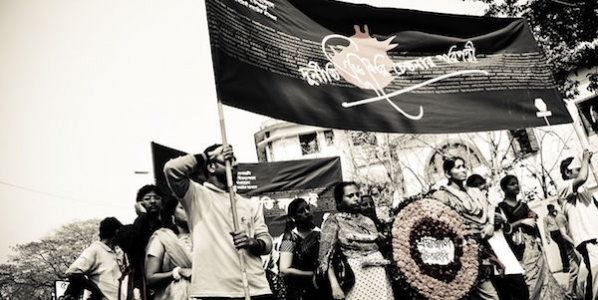 In this article, Dr Khurshed Alam frames corruption and its history in Bangladesh by observing it in terms of a normative determinant – a sociological interpretation of this economic phenomenon. Corruption was not as prevalent in Bangladesh in the past particularly in the 60s. People tended to be normatively against it as they considered corruption to be an antisocial activity – not that it was necessarily rooted in the religious belief since societal Islamic norms were arguably less ingrained. Nevertheless, any person identified as involved in any kind of corruption in the society was boycotted or abhorred by his neighbours as part of social punishment. There was also another social creed whereby if a son was doing something anti-social, he could be regarded in extreme cases as “Teaizza Putra” (the disowned son). This value system was maintained by almost everybody, irrespective of their classes and political commitments. At that time there was a similarity between this normative order and the existential order which might be recognised as a ‘harmonic system’ existing in the society. The informal social authority played the defacto role of political authority with or without legal sanction. It was indeed, a mixture of religious and social sanctions which was instrumental in compelling people to uphold this value system. The present day corruption can be traced back to 1971 when public looting took place during the liberation war of 1971, when the established political order nearly ceased to exist. With the collapse of political order in Bangladesh, no functional political authority was existing there at that time and public looting took place in the rural areas as well as urban ones where, irrespective of party affiliation, many people joined in. The age-old system of maintaining a sense of righteousness through moral self-discipline began to waver with the horrendous act of mobocracy. This can be described as an anarchic cause of corruption in Bangladesh. Since then a change in the normative order has taken place which entailed widespread corruption in independent Bangladesh. The process became further intensified during the work of reconstruction and rehabilitation in the country. The economic rehabilitation has not worked for restoration of the social fabrics that were torn during the liberation war. Soon after independence, the rule of law was almost absent. All the infrastructures of the country were damaged whatever little development work was done under the Pakistani regime. The law enforcement agency had to be reorganized and reconstituted for running the country to address the unstable situation. In order to reinstate the economy a number of countries offered relief and rehabilitation support. But since nearly a dysfunctional social and legal system was there, powerful elites, particularly politicians and bureaucrats, started embezzling those relief materials and other resources that were under their disposal to dispense. The scenario worsened following the 1974 famine during which millions of poor people were between life and death. The upper strata of the society did not face the same crisis and as a result it took away all types of confidence of the common people on the state machinery. The ruling party showed very little capacity to handle the situation – particularly since the famine disrupted the systematic functioning of the country and whatever achievement it could make over the three years of after independence. Protesters at an anti-corruption rally in Bangladesh. Photo credit: Faisal Akram, Wikimedia Commons, CC BY-SA 2.0. This normative degradation resulted in pervasive corruption and misrule. In one speech, Bangabandhu Sheikh Mujibur Rahman, the founding father of the nation, declared: ‘Everyone gets gold mines, I have got a mine of thieves’– a remark made by him about corruption culture in Bangladesh. Sheikh Mujibur Rahman, however, tried to restore the confidence of the people after the devastating flood and famine, and to combat the situation by bringing about a change in the political system and economic management including food production. The assassination of Bangabandhu in 1975, ended his attempts to improve conditions. After this tragic incident, the two military authoritarian regimes of Zia and Ershad ran the country for one and half decades, incorporating Islamisation to consolidate military power by using the dominant values of the majority people. During this time, both rulers obtained the support from dominant Islamic parties of the country and the Islamic academic institutions. However, that Islamisation has not increased the ethical standard of the people in general. Rather a consolidated civil and military bureaucracy, a more mercenary system developed in the country contributing to a further increase of corruption. This despotic cause of corruption in Bangladesh created the demand for the restoration of democracy which became the main political agenda in the country in late 80s. But even the initial gain in restoration of illiberal democracy in 1991 has contributed almost nothing to recovery of the ethical standard. Both the Islamisation and democratisation did not show much potential to restore the lost values for fighting corruption. This can be described as oligarchic cause of corruption in Bangladesh. Indeed, with the passage of time Bangladesh has come to witness numerous forms of corruption emanating from the discussed anarchic, despotic and oligarchic system of rule. The country is in need of a turning point through creating and capacitating institutions to get rid of pervasive corruption. For that, many efforts could be made, including: establishing new norms for government institutions and officials; making institutions more effective; service delivery monitoring; enforcement of anti-corruption law; effective mechanisms to investigate and prosecute corruption; and to respect the freedoms of the press. If such measures can be taken then Bangladesh may at last rid itself of the blight of corruption. This article gives the views of the author, and not the position of the South Asia @ LSE blog, nor of the London School of Economics. Please read our comments policy before posting. Thank you for a nice article, Kurshed. Corruption has a distinctive form and history in each country, and you highlight this powerfully. I remember people saying that the Ershad government was the height of corruption never seen before – little did they know. Or was it worse then? But in my view anti-corruption measures rarely work. It has to be addressed indirectly to succeed.. Thanks David. After end of Ershad regime, it went up as the allocation of resources has gone up unabatedly without creation of counter mechanism to control corruption. Anti-corruption measure itself will have limited impact in Bangladesh. Rather Bangladesh is suffering from two types of economic losses- one is the misuse of resources and another is the corruption. At present misuse of the resources is also high for which needs based budget system to be introduced and another is the corruption. For preventing corruption institutional system to be developed first, followed by other measures. Thank you very much dear Khurshed sir for your nice informative article. South Asia @ LSE welcomes contributions from LSE faculty, fellows, students, alumni and visitors to the school. Please write to southasia@lse.ac.uk with ideas for posts on south Asia-related topics. Follow South Asia @ LSE on Twitter @SAsiaLSE or sign up for the newsletter by writing to southasia@lse.ac.uk. Prospective students from South Asia can contact the Student Recruitment Office for more information about studying at the LSE. Bad Behavior has blocked 473 access attempts in the last 7 days.